Lewiston, NY - William Close prepares his Earth Harp for a concert at Artpark. Described as a musical phenomenon, America’s Got Talent Finalist William Close and The Earth Harp Collective will be performing along with Big Bang on September 2. Details: The pinnacle event of Artpark’s season takes place September 2nd with BIG BANG presented by globally renowned performers Plasticiens Volants. The evening also features musical phenomenon and America’s Got Talent Finalist William Close and The Earth Harp Collective. Watch two extraordinary outdoor spectacles collide for an unforgettable evening in one of New York State’s most scenic outdoor venues. 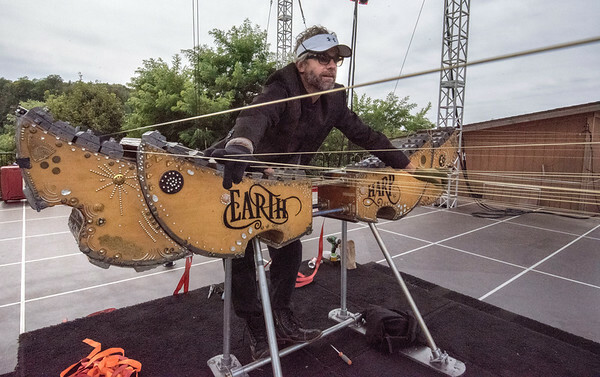 Since its inception from the mind of William Close, the magnificent Earth Harp has transformed an array of architecture, landscapes, festivals, and venuesinto the world’s longest environmental symphonic stringed instrument. Now, Artpark will become the latest venue to fall under William Close’s spell as the world renowned installation artist performs with his Earth Harp Collective on the newly extended Earth Harp, now featuring 24-36 1,000+ foot strings thatwill sail and wail above the audience. Joining William Close and The Earth Harp Collective is a dazzling one-night only exhibition by Plasticiens Volants who combine large-scale pieces of floating art in the skies and performance artists on the ground. The French theatrical troupe has been captivating audiences across five continents and counting for the last forty years. Artpark will be the place to be to experience the U.S. premiere of Plasticiens Volants’ BIG BANG, an aerial performance that translates the scientific theory of the universe’s creation into a poetic tale. For a sneak peek - watch the BIG BANG video preview!